German heritage, old-world tree-lined streets, a bustling tourist presence, and local business diversity. Having lived in the Adelaide Hills area for the past few years I felt it necessary to visit one of the local Hahndorf bed and breakfast establishments and hope for a memorable “in town” experience. I most certainly found one. Amble at Hahndorf B&B was established in July 2008 by Di Meyer and Roger Brock, owners and hosts of four variations of B&B bliss under the “Amble at Hahndorf” banner. 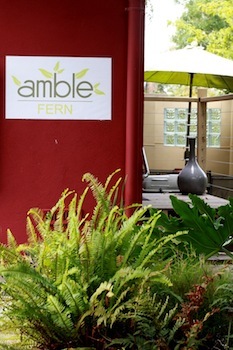 I had the honor of experiencing a weekend at one of the Amble at Hahndorf accommodation options called Amble FERN, a contemporary-styled studio, well-appointed and accommodating up to four people. The first thing that captured me was the outlook over the front porch to the front fern garden, taking me to a place of retreat and oneness with nature immediately. On entering the studio, I was greeted with a pleasantly neat presentation with particular attention to detail which instills a warming sense of “welcome” from the moment you step inside the door. The studio was filled with lovely natural light and the living area with its open main bedroom presented a cosy, yet roomy, space to let the world go by. 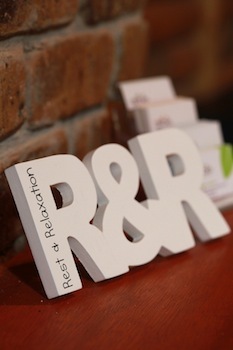 I was transformed into R&R mode within minutes of arriving. The kitchen bench displayed the local directory of attractions and local business suggestions as an accompaniment to the already-established focus of “local support” from Di and Roger. In addition, a vast array of provisions greeted me on that same kitchen bench, namely Cocolat truffles, Beerenberg jams and sauces, breads, muesli, and cooked breakfast provisions of bacon, sausages, eggs, tomatoes, fresh orange juice, and creamy milk, all locally sourced and proudly recommended by my hosts. Amble FERN is complete with a main king bedroom which can transform into singles for larger groups (up to four), a second bedroom with two singles (also able to be converted into a queen for couples), separate shower/spa and toilet/vanity rooms, and a spacious living and attached open kitchen area overlooking the front porch and fern garden. A private courtyard complete with gas BBQ and outdoor seating allows you to relax outdoors in proximity to the garden area and take in the meandering bird life. The inside décor is of a contemporary/modern feel offering a touch of sophistication, and a common “fern” theme is visible from both within and outside the studio in keeping with its title. I was privileged to share in some quality time with my hosts, Di and Roger, and get an insight into how their desire for presenting a memorable B&B experience had come about, and what their vision is for their business. I was pleasantly infused with their belief in the satisfaction of their clientele and in the old-world values of attention and interaction to make sure every visitor who comes to Amble at Hahndorf has a positive experience. Saturday morning, I “ambled” to the main street of Hahndorf to sample some of the local attractions, with a visit to Udder Delights for cheese tasting and coffee (just down the corner from the accommodation). On Saturday evening I visited The Mustard Seed Indian Restaurant for a wonderful meal and excellent, informative table service by the young waitress. I also had the opportunity to view the three other accommodation options available to visitors at Amble at Hahndorf. The “amble” theme is carried through into Amble WREN (an intimate self-contained cottage for two), Amble OVER (a stylish upstairs apartment for two with rural and garden views from two balconies), and Amble INN (a fully-furnished log cabin-style house for larger groups — up to six — featuring three bedrooms, a full kitchen, and an open living area with raked timber ceilings and lead light windows giving that “lodge” feel). Each offers its own experience, with unique presentation and attention to detail. In association with the accommodations themselves, Amble at Hahndorf is complemented with a very “amble” style garden setting with places to have some privacy, relax, and be one with nature. To the rear of the property you can also venture to the adjoining paddocks and feed the neighbor’s horses, sit and look out over the rural setting, or take in the active bird life. Overall, Amble at Hahndorf presents a very memorable stay, and whether you’re a couple, family, or sole traveler passing through the Adelaide Hills or in Adelaide visiting, Amble at Hahndorf is one not to miss for a genuinely hospitable local experience. To make a booking with Di and Roger to stay at Amble at Hahndorf, visit their interactive website at http://www.amble-at-hahndorf.com.au. Links to the local attractions and food and wine suggestions for Hahndorf and the Adelaide Hills region are also provided.